The first half is about another murder totally unrelated to the Warren Dulaney case. On the rainy morning of October 14th, 1968, six miles south of Ukiah, a seven-year-old boy ran out of his trailer home and found his mother dead in the wet ground outside the front door. The boy ran for his grandmother's trailer nearby. She was dead too, garroted like the boy's mother with a pair of long leather boot laces. The dead women were Nancy Warren, 64, and her granddaughter, Clyda Jean Dulaney, 24, wife of CHP officer, Don Dulaney. Clyda was eight months pregnant. The seven-year-old was Johnny Ussery whose younger brothers Lane, 5, and Brett, 4, were still asleep. The three boys were from Clyda's first marriage to a logger named John Ussery of Eugene, Oregon. Clyda had left Ussery for Don Dulaney, a Ukiah-based CHP officer twice her age. She was pregnant with Dulaney's child when she was murdered. Clyda's former husband was quickly eliminated as a suspect when it was verified that he'd been in Medford, Oregon at the time of the murders. Finding his mother and his grandmother dead, Johnny had calmly returned to his trailer to get his younger brothers dressed, then, his two little brothers in tow, the three boys trudged south to the home of Don Torell where Johnny told Mr. and Mrs. Torell that "Mommy and Grandma are dead." A swarm of deputies led by Sheriff Reno Bartolomie was soon on the scene. The sole witness to the previous night's mayhem, which occurred in a driving rain that obliterated the footprints assumed to have surround Clyda Dulaney's outdoors corpse, was Mrs. Warren's miniature dachshund. The two dead women were fully clothed. They'd both been brutally beaten about the face before they'd been strangled with brand new hightop leather boot laces, two turns of which had been pulled tight around the neck before the laces were knotted in back. Mrs. Warren operated Nancy's Antique Sales on Highway 101 south of Burke Hill o the two-lane portion of the highway about where the strawberry fields and sales stand are today. Clyda Dulaney was a graduate of Ukiah High School who, only months before, had left her husband for officer Dulaney, 49, a man several years older than her father. Clyda's former husband had been engaged in a bitter custody dispute with Clyda for his three boys. Mr. Ussery said Clyda had deserted him and the boys for Dulaney, evidence, he insisted, that Clyda was unstable and therefore not a fit mother. Robbery was the apparent motive. A metal cash box had been rifled and left on a table although a plastic box and glass jar containing approximately $300 in cash rested in plain sight in a closet of the older woman's trailer. Officer Dulaney lived in Ukiah with a teenage daughter from his previous marriage while Clyda and her children lived on her grandmother's property at the south end of Burke Hill. Dulaney said they lived apart while he looked for a house in the Ukiah area that would accommodate him, his pregnant new wife Clyda, her three boys and his daughter. When Clyda gave birth to their child, Dulaney would be supporting a family of seven, and he said he wanted a house big enough for all of them. Dulaney was in Sacramento for a special CHP training course when his new wife and her grandmother were found dead. The investigative assumption from the beginning was that the two women were murdered after he was either in Sacramento or on the road there. The CHP officer told the Sheriff's office that he dropped his wife and stepchildren at Nancy's Antique Shop at 9:30 the previous night with the intention of continuing on to Sacramento. But, he said, he'd forgotten his uniform, so he returned to his Ukiah apartment, picked up the uniform and continued on to Sacramento via Highway 20 east where he signed in at the Academy at 1:45am. A neighbor said she saw a blue pickup truck leaving an orchard near the antique shop about 8:15 the morning the women were found. She said fiver persons "wearing hippie-type clothing" were in the vehicle. Dulaney, 49, who was described as genuinely distraught by investigators, quickly returned to Ukiah. 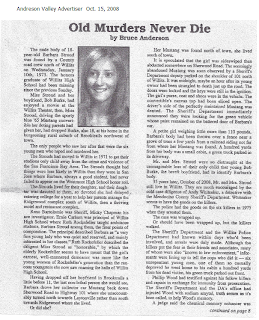 "The only information I had was what I had read in the newspapers," Dulaney told the Ukiah Daily Journal at the time. He said he and his expanded family had been watching The Wonderful World of Disney at Dulaney's Ukiah apartment before he, Clyda and the boys headed south for Clyda Dulaney's trailer six miles to the south. The family had left Ukiah about 8:45. Dulaney said he dropped his wife and the three boys off at their temporary home and headed for Sacramento where he was scheduled to begin a CHP refresher course the next day, Monday morning. Dulaney said that he had reached Highway 20 before remembering that he had failed to bring his uniform. He then returned to Ukiah, picked up his uniform, and resumed his trip to Sacramento where he logged in at 1:45am. Dulaney hired Timothy O'Brien, a Ukiah attorney who often represented law enforcement people. O'Brien, who soon afterwards became a superior court judge, said that Dulaney had been "deeply concerned over any false impression which might have been gained regarding his cooperation with the Sheriff's Department following the death of his wife and child." 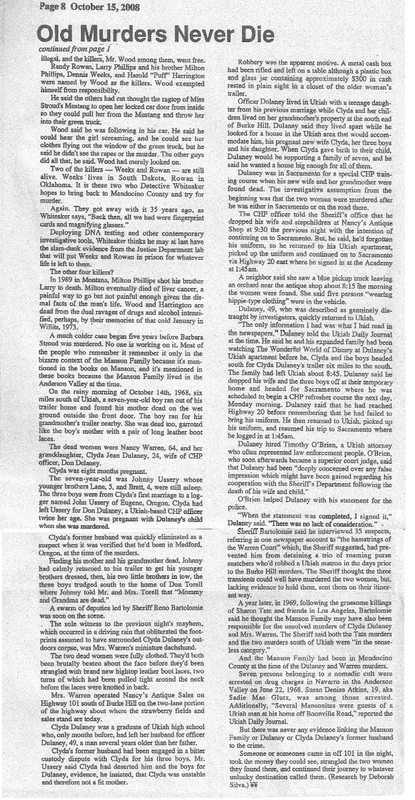 O'Brien helped Dulaney with his statement for the police. "When the statement was completed, I signed it," Dulaney said. "There was no lack of consideration." 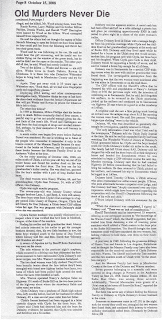 Sheriff Bartolomie said he interviewd 35 suspects, referring in one newspaper account to "the hamstrings of the Warren Court" which, the Sheriff suggested, had prevented him from detaining a trio of roaming purse-snatchers who'd robbed a Ukiah matron in the days prior to the Burke Hill nurders. The Sheriff thought the three transients could well have murdered the two women, but lacking evidence to hold them, sent them on their itinerant way. A year later, in 1969, following the gruesome killings of Sharon Tate and friends in Los Angeles, Bartolomie said he thought the Manson Family may have also been responsible for the unsolved murders of Clyda Dulaney and Mrs. Warren. The Sheriff said both the Tate murders and the two murders south of Ukiah were "in the senseless category." And the Manson Family had been in Mendocino County at the time of the Dulaney and Warren murders. Seven persons belonging to a nomadic cult were arrested on drug charges in Navarro in the Anderson Valley on June 22, 1968. Susan Denise Atkins, 19, aka Sadie Mae Glutz, was among those arrested. Additionally, "Several Mansonites were guests of a Ukiah man at his home off Boonville Road," reported the Ukiah Daily Journal. But there was never any evidence linking the Manson Family or Dulaney or Clyda Dulaney's former husband to the crime. Someone or someone's came in off 101 in the night, took the money they could see, strangled the two women they found there, and continued their journey to whatever unlucky destination called them. 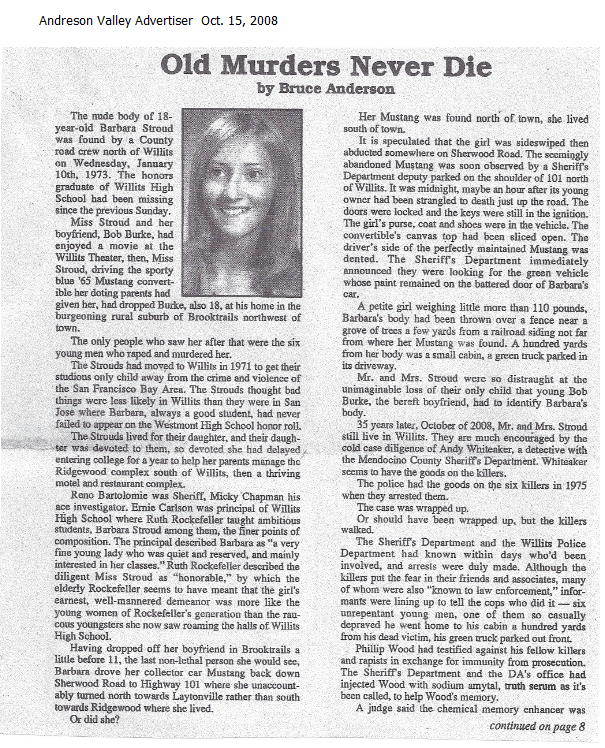 This was the article that spurred Patty to photograph the death site back in February. damn, there is going to be a shitstorm if there is pertinent information on the "Tex tapes" about these murders and it was sitting there all these years. The leather thongs and knots and the blue pickup with hippie clothed types certainly lends a basis of inquiry into the Family. What males amongst the Family would have been in the area? Most say it was to early for Tex to have been present. Was Clem around then? For some reason I can't see Manson or any of the girls being physically capable of strangulation. It takes strength. Someone should take a run at Ella Jo Bailey. She was one of the 'witches of Mendicino' so was probably in the area at the time of the murders but quickly split from the Family after Hinman's murder. Maybe she grew a conscious after all these years. Yep, Patty would not have found the murder site had it not been for Deb. She ROCKS. Hi guys, my name is Lauren. I've been a "lurker" for years and finally decided to sign up! This whole new case is very fascinating to me. If I am not mistaken Leary, I believe Clem joined the family around spring of 1968 at Spahns. I could be wrong. And yeah, I agree with the Ella Jo Bailey comment as well. Great post Matt. The five persons in hippie type clothing and the possibility of the Tex tapes sure are intriguing. I'm on the edge of my seat in anticipation of the possibility of this case being solved. On a lighter note, I'm primarily an A's fan but I must say..... GO GIANTS !!!!! Ola Lauren. Let me be ther first of many who will welcome you here. There are so many 'loose threads' with regards to the Manson Saga it is a never ending source of conversation and debate. I am really grateful and proud of the Saint and Deb S for getting this one moving a bit and especially rooting for Johnny U. for being open minded and a flat out good guy. Come on, Ella Jo. Why not? Jesus, that's not cleavage on Lauren's photo is it? That's not allowed on a Manson site, is it? just kidding, I say, I say. Lots of beautiful women on this site. Ella was interviewed by the Sheriff and Deputy D.A. Burton Katz in 1970. When Katz asked her why she left the ranch, Ella said she was scared because things had changed. It wasn’t the scene that it was for the year-and-a-half that she had been with the group. She didn’t want to be involved with robbing or killing people. And she didn’t want to be killed herself. on that basis we would have to assume that Ella Jo either wasn't around Ukiah when the murders happened, or that the Family wasn't involved. If Ella was as set against violence as she seems to have been then you have to assume she would have left then if she knew of Family involvment. But it is always dangerous to make assumptions when contemplating TLB. According to an Aug. 9 1968 Ukiah Daily Journal article. The five girls arrested were appointed attorneys for the three felony drug counts they were charged with. They were all appointed different attorneys with Ella Jo getting Tim O'Brien as her attorney. Tim O'Brien later was Don Dulaney's attorney after Clyda was killed. I'm not sure too much should be read into that as there were only so many attorneys in Ukiah in those days. All of the girls except Ella Jo were held in jail pending the outcome of the charges against them. Ella Jo was released on her OR to undergo surgery. Deb, your knowledge of this case is astounding. Can Patty say thanks again? Thank you Patty for being interested in this case! I would like nothing better than to see it solved. Putting out as much information as possible might help, it just might click on a light bulb in someone's head and be the lead needed to put the pieces together. So if Tex mentioned these murders in the tapes, would that be enough to prosecute? Would the bodies need to be exhumed to look for DNA? So intriguing! Both Clyda Dulaney and Nancy Warren were cremated so exhumation is not an option. Any possible DNA would be on whatever remains in evidence.